Mehndi decoration ideas that are simple & classy! One of the most important aspects of a mehndi function these days is the mehndi decoration at home. An afternoon of mehndi a few days before your wedding is one of the times when you get to spend some fun moments with your close ones, and some beautiful mehndi decor helps you create that perfect backdrop for those fun clicks with your girl gang! Having a pretty mehndi decor means having the prettiest pictures that you can look back in awe! Bright floral outdoors with photobooths and a well-decorated jhoola is the norm these days. However, if you are confused on what type of decoration you should have, then scroll down for some amazing mehndi decoration ideas that you can easily implement at home or even in your backyard or venue. Beautiful swings like these decorated under a tree with pink and purple tassels along with marigold parrot figures sure make for a gorgeous mehendi decor in your backyard or garden. You can even choose the theme to match your mehndi outfit and look colour coordinated like a boss! This pretty canopy of flowers is the perfect mehndi decoration idea for a small indoor space. If you are looking for simple mehndi decoration ideas at home, then this one just fits the bill. What’s more? It uses just simple flowers, which makes it pretty affordable too! If you have a huge open space available for your mehendi function and want something bright, peppy and colourful, then this pink and orange themed decor is a lovely choice! And the overdose of marigold flowers only makes it better! Nothing gives you more eye-catching pictures than a bright and full-of-colour mehendi decor on a lawn. Love how this decor has multiple seating arrangement for guests to sit and enjoy the mehendi function comfortably. A cool, breezy and outdoor mehndi event calls for a mehendi decor with some spacious tents replete with seating area, colourful throw pillows and minimal floral decoration. This is one of the simplest mehndi function decoration ideas at home. All you have to do is make a canopy of white sheets, fairy lights and floral stings while using bright marigold flowers to accentuate and complete the look of the entire mehndi decor! This kind of grand mandap-style mehendi decor is ideal if you have a lot of guests coming in for your mehendi function. Full of colourful charpais, inverted umbrellas on the ceiling and bright throw pillows make this mehendi decor idea totally photogenic! If you are hosting your mehendi function at a resort or hotel which has a pool, then this cute and simple mehndi decor is something to take inspiration from. Making a cute backdrop for the bride to sit during the mehendi function is a great idea. While you can have a bigger tent with seating for other guests, a mehendi decoration backdrop like this one will steal the show for the bridal mehendi pictures! No matter how many decor styles come and go, a classic floral mehendi decoration is timeless. If you are not the one for bold colours and bright decor, something simple and tasteful like this will surely catch your fancy. If you wish to include cute mehendi decoration stuff like colourful teapots, bird cages, wooden trays and metal furniture, then this lovely mehendi decoration is something you can surely take inspiration from. If you want to have a monochrome mehendi decor, then this bright and cheerful yellow-themed decoration is a great idea. Such kind of mehendi decoration ideas work best outdoors, especially for spring-summer weddings by the beach or pool. Didn’t you just relive your childhood memories looking at these multicolour pinwheels? Well, you can take inspiration from this outdoor mehendi decor and create a tent with pinwheel theme to give it a fun mela-kind-off feels. Move aside fancy chairs and props. Make way for the humble Indian-style baithak where all your friends and cousins can sit comfortably while applying henna and clicking cute pictures! The use of orange marigold flowers on the as well as the backdrop gives this decor a truly Indian vibe. Pick any wall in your living room, add a bright pink curtain with cute wall hangings and make a floral canopy of marigolds above your favourite sofa chair and you’re good to go! There’s always a way to see mehendi decor images and get inspired to create something similar in a lesser budget! Win-win, right? A grand floral canopy like this one makes for a fabulous mehendi decoration idea for both indoor or outdoor celebrations. 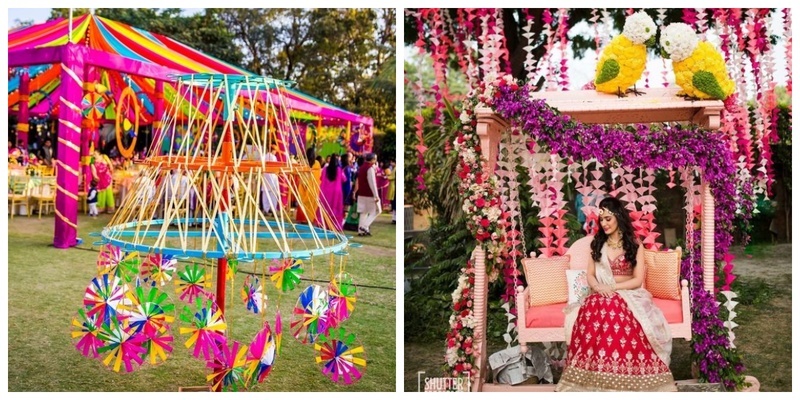 Apart from photo booths, floral swings are a huge trend for mehendi decoration. If your house has a backyard or garden with a swing, you can decorate it bright drapes and your favourite flowers one of the simple mehndi decoration ideas at home! A grand mehendi decor like this one is apt for large outdoor spaces and a mehendi function that has a lot of guests. Multiple tents in bright colours with floral chandeliers, inverted umbrellas and Indian-style baithak makes this mehendi decor look right out of a Bollywood movie! A bright tent with multicolour paper cut-out chandeliers and colourful charpaais make for a fun and cute mehendi decor idea. If you are not the one to shy away from going all out for your wedding functions, then this adorable mehndi decor with props like teapots, dhols, matkas and dolls hanging from the ceiling is a great choice for you. A small tent like this in your backyard is perfect if you are planning to do your mehndi decoration at home! All you need is some colourful drapes and strings of genda phool, and you are all set to have a photogenic mehendi decor without spending a bomb. This mehndi decoration with huge floral wheels and colourful umbrellas on the ceiling is as grand as it gets. Perfect for brides who want to go all out and crazy with their mehndi decor. A simple floral wall backdrop with the kickass dulhaniya signage and multicolour inverted umbrellas make for a cute yet simple mehendi decor idea that can be easily executed at home as well. A simple swing like this one, decorated with multicolour flowers makes for an elegant mehendi decor option. The flower accented dome on top just adds a hint of drama to the whole setup! This lovely setup made with drapes and white floral strings make for a simple mehndi decor idea that you can take inspo from and design at home too! Amazing what a couple of colourful drapes can do to your mehndi decor, right? Take a cue from this set up your simple mehndi decoration at home! Now, a grand mehendi ceremony requires a lavish tent like this for sure! If you have many guests coming over, opt for a big spacious tent like this one with comfortable seating options and minimal accents. This extravagant mehndi decoration with white flowers and red roses is ideal for the bride who doesn’t mind a floral overdose on her mehndi afternoon! If pink is how you have envisioned your mehendi decor to look like, then this outdoor setup with flowers, feathers and seating arrangement all in pink is perfect for you. Mehndi decors which have floral wreaths are taking the wedding decor scene by storm. Arranging this mehndi decor at home is super simple. All you need is a cute sofa with throw pillows and some orchids on fake stems or bougainvillaea creepers shaped in a circle. So, which of these mehndi decorations did you like the most?